Goodyear Autocare – Basak Mandaue Aldo Service Center, Inc.
Goodyear Autocare – De Veyra Cebu Aldo Service Center, Inc.
Goodyear Autocare – Talamban Cebu Aldo Service Center, Inc.
Goodyear Autocare – Ledesma F&E Enterprises, Inc.
Goodyear Autocare – Kalibo F&E Enterprises, Inc.
Goodyear Autocare – Mandurriao F&E Enterprises, Inc.
Goodyear Autocare – Roxas F&E Enterprises, Inc.
Goodyear Autocare – Puerto Princesa F&E Enterprises, Inc.
Goodyear TyrePro – Mabolo Speedy Tires, Inc.
Goodyear Autocare – San Fernando Pampanga Tire City, Inc.
Goodyear Autocare – Nangka Marikina Tyre Station, Inc.
*Note: Available stocks vary from outlet to outlet. DOT for sale items range from 1613 onwards. 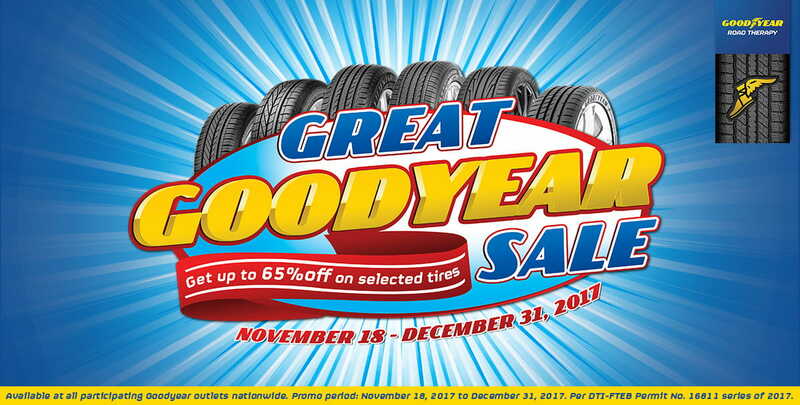 All Goodyear products are covered by Goodyear’s 5-year Warranty.